King Abdullah of Saudi Arabia has called on followers of the world's main religions to turn away from extremism and embrace a spirit of reconciliation. The king was opening a conference in Madrid which brings together Muslims, Christians, Jews and Buddhists. He said the great conflicts of history were not caused by religion, but by the misinterpretation of religion. 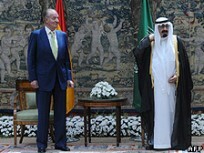 King Juan Carlos of Spain, the co-host, said Spain had always sought to promote international dialogue. Critics have dismissed the gathering as a propaganda gimmick by the Saudis who, they say, are not best placed to host a meeting on religious tolerance. Wahhabism, the strain of Sunni Islam that is officially practised in Saudi Arabia, is considered one of the religion's most conservative and intolerant forms. "My brothers, we must tell the world that differences don't need to lead to disputes," King Abdullah said. "The tragedies we have experienced throughout history were not the fault of religion but because of the extremism that has been adopted by some followers of all the religions, and of all political systems." Correspondents say King Abdullah has made reaching out to other faiths a hallmark of his rule since becoming king in 2005. He is the first reigning Saudi monarch to meet the Pope, for example. In June, Abdullah held a religious conference in Mecca in which participants pledged improved relations between Islam's two main branches, Sunni and Shia Islam. The conference is sponsored by Saudi Arabia and is billed as a strictly religious, non-political affair.